Postcards from Manila: #308 Holy Cows! Those unfazed by inclement weather must be prepared to accept a sunset sky without a clear view of the horizon. Sure, the sun's crepuscular rays found their way to earth, but we needed more than that. We needed an interesting foreground. We needed a miracle. We were in the town of San Roque in Antique. It had rained all week prior. Heck it was still drizzling the morning we flew in. "Don't expect to see the sky, our host warned." Yet try we must, as we found our way to our sunset point with a prayer in our hearts. But just as the sun started its descent, spreading its crepusculars like a peacock's tail, a couple of herdsmen led their cows right into our compositions. Holy cows! Enjoy. 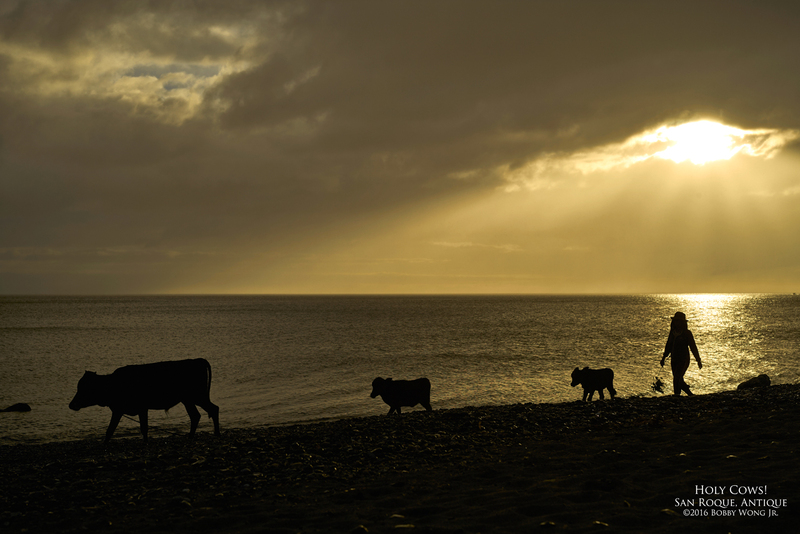 Pixel-peepers: It's not enough to silhouette folks and cows walking across your composition. To perfect the illusion of motion, you need to carefully watch their feet, to wait and click at exactly the right moment, when their legs are spread apart, in obvious motion. And then the herder's too. Click.